Sticker.Place invites artists to create and share their own iMessage sticker designs. 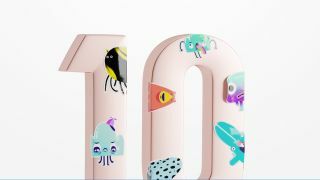 Now, thanks to Apple's more recent iPhone update, iOS 10, you can personalise your iMessages like never before with stickers – and that has opened an avenue of opportunity for vector artists, too. Sticker.Place is a source of stickers for your iPhone's iMessage app, and this set of 10 eye-catching stickers below are sure to liven up even the most cursory of text messages. There are a range of characters and themes to choose from, including geometric gentlemen and cutesy critters. Fermanelli describes the Boompers as minimalistic, cute, and brave. As well as showcasing a range of carefully crafted stickers which you can download for just $0.99 per set, Sticker.Place is also open for submissions from graphic designers. To get involved and earn money from each sticker set that you sell, simply head over to the Sticker.Place site to request an invite. Don't worry if you don't know how to programme for iOS 10, you just have to send your art over as PNG images and the team at Sticker.Place will do the rest.